When you play the game of drones, you win or you die. Or your president stabs you in the heart and twists. There is no middle ground. Life and death can make for compelling deal breakers in politics. More often than not, we face this reality in the ongoing disputes over abortion law and single-issue voters. But there’s nothing quite like the games of war in a wearily introspective superpower afflicted by enduring frustration and quixotic performance art of leadership. Over the past decade, so many thousands of lives have been lost to terror and the fight against it. Even as the Iraq War has finally ended—for the United States, anyway—American-led campaigns across the Middle East continue the Sisyphean task of eradicating violent extremism. 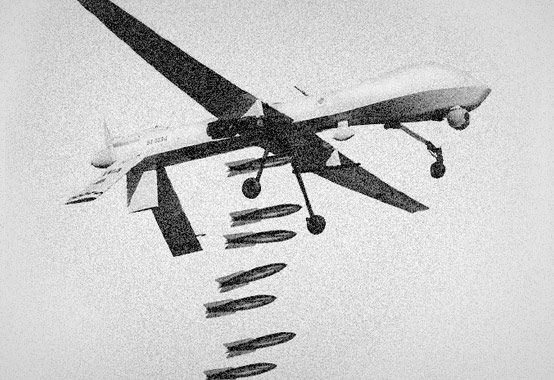 Enter the drones. As though by miraculum ex machina, the U.S. can target and eliminate enemy combatants without deploying a single boot to a warzone of the whole. But as with all developments in war, there are costs. Some induce nightmares. For liberals who cannot reconcile the costs with the values, the totality of these issues constitutes a moral event horizon for Obama. Many of these disaffected are understandably wary of jumping on the Gary Johnson bandwagon. But I’ll go out on an olive branch and suggest a Romney presidency has more to offer the progressively malcontent than meets the gag reflex. We all know that war is neither painless nor clean, and collateral damage is as heartbreaking as it is inevitable. But which would you prefer, the rhetorical embrace of a friend who stabs you in the back—from the safety of a remote machine—as you shield his treachery from criticism, or the political opponent who, at the very least, will put his cards on the table and allow you the opportunity to defend your values, such as they are? I don’t know about you, but I prefer my devils where I can see them. It makes for an easier kill peacekeeping. Categories: Uncategorized | Tags: ACLU, Charles Krauthammer, congressional oversight, drones, extraordinary rendition, military commissions, Obama, Romney, terrorism, war, warrantless surveillance | Permalink.